I want to take a minute to address a topic that many of you are interested in, and that’s Manufactured Spending. But first, a primer for those that don’t know what it is. Manufactured Spending (MS) is a method by which you can accumulate points/miles very quickly and at very little to no cost. The whole idea here is that you use your credit card to purchase something that you can then sell/liquidate for the same amount of money. Imagine you purchase $1,000 worth of groceries with your American Express Gold Card and then sell those groceries to other people and recoup your $1,000 outlay. Well now you’re 2,000 Membership Rewards Points richer (remember 2x points for groceries with the AMEX Gold Personal) and no worse for wear money wise. That, in a nutshell, is Manufactured Spending. One of the ways that you can legitimately MS is by using a service like Plastiq (which I do) to pay for things that normally would not be payable by credit card, like your rent or mortgage. Basically what happens is that you pay Plastiq with your credit card and Plastiq either sends an electronic payment or a cheque to pay whomever you owe. They take a percentage for their efforts. Each bill and payment method combination has it’s own fee so check out the site to determine what your fee would be. I personally use Plastiq with my American Express Gold Business Card because you can set Plastiq as a preferred vendor and receive 2x points for every dollar you spend. I put my mortgage through them and pay 2.25% for using my AMEX card. While it is not a free method of MS, it certainly can quickly increase your points balance and help you meet minimum spend requirements. If you would like to sign up for Plastiq, you can use my Referral Code 19101 to received $200 worth of Fee Free Dollars (FFD). This means you don’t pay fees for the first $200 of spend you have with Plastiq. Personally, this is an excellent method of MSing for me because it’s sustainable, legitimate and easy. In the past, you could buy coins from the Canadian Mint that were legal tender using a credit card and then cash those coins in at the bank. For example, you could buy a 5 x $100 coins, have it shipped to you for free and then take those coins to the bank and deposit them. You would then take that money and pay your credit card that you used to buy the coins in the first place. Well, the Canadian Mint has caught onto the practice and has eliminated their face value coins from their website. Another example is that Costco used to only accept AMEX in store but you could purchase items on the Costco website using your Visa or Mastercard. If the item didn’t satisfy you, you could return it in store but because their point of sale (POS) systems could only process AMEX cards, they would refund you in cash or on debit. You could then take that money and pay the Visa or Mastercard you used to pay for the item in the first place. In these above examples, you become points rich and cash neutral. This method of MS is a unicorn. Very difficult to find. In the above examples, you probably have only heard of them recently from other Canadian bloggers and the reason is that they saw the writing on the wall and knew that these methods would be shut down. The point here is that you are very, very, very unlikely to read about active methods of MS because there is no upside to bringing in a bunch of people into the opportunity. The more people using the method, the more likely it is that it becomes obsolete. With MS, there is a certain level of trust that needs to be built in order for people to bring you into the opportunity. That’s why I would highly recommend attending conferences like PointsU, where you will actually be able to put a face to a name and start to interact with that person. You could also reach out to other Travel Hackers for a coffee and see where that leads. I can tell you that MS opportunities are much more prevalent in the United States than in Canada so you may find that finding these opportunities can be very difficult without help. It takes a certain mindset to see the weakness/opportunity in a program and another type of mindset to take a leap of faith and hope that it pays off. With the MS example with the Mint, there were reports of some banks refusing to deposit legal tender coins so if you only had a few banks available to you and they all said no, you could literally be sitting with thousands of dollars worth of coins. Sure, you could eventually liquidate them but your credit card company wants its payment within 28 days of billing. All this to say that there are certainly risks associated with MS. 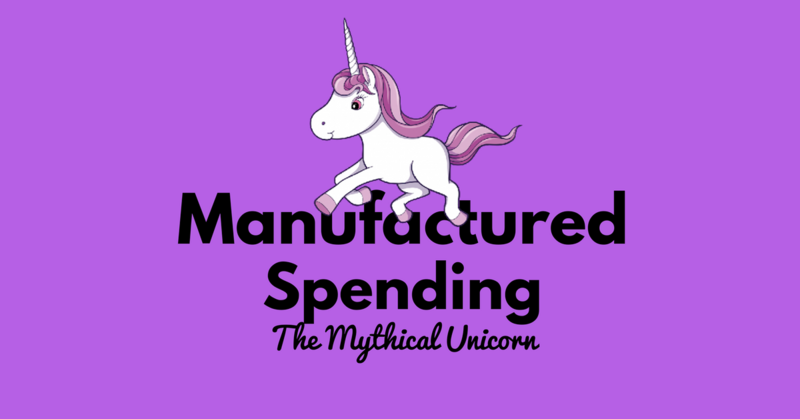 Manufactured Spending is not a topic that I will cover on the blog very often for the reasons I stated above. Also keep in mind that the methods shared on the other blogs are likely to be dead, dying or have major flaws in their methods. If you want to MS, start building your network of Travel Hackers and see where that takes you. I am thinking of starting up a Calgary Travel Hacking Meetup to help facilitate these types of discussions so if you’re interested, let me know in the comments below. Should You Make A Tesla Reservation to Make Minimum Spend? Hi Jayce – I would definitely be interested in participating in a Calgary Travel Hacking meetup. Let me know! I’d be interested – please keep me in the loop. Dave, are you in Calgary? I am from Calgary and would be interested in a meetup. Up for coffee if you are ever in Quebec! Great tip, I am in the same boat as many of the readers trying to meet min spend. Got the Chase Ink Preferred and AMEX SPG recently and trying to finish meeting min spend. I used Plastiq and my mortgage payment went thru in 5 days (even though they indicated 7 days). There is huge bonus from Plastiq lately to use for your minimum spend requirements by using it to pay for your mortgage. You can get $500 FFD (as May 25, 2017). I have been using it as last resort to meet the min spend. does any one use Plastiq to pay RBC mortage? I have a question about Plastiq. It charges a 2.5% fee on top of the bill you are paying. which is above the CPM < 1 threshold for earning miles. Am I missing something here? I can see it being useful for meeting minimum spend or to hit a target for redemption, but for general purposes it seems an expensive way to earn points. Your calculations are correct, however, Plastiq will sometimes have promotions that reduce the payment processing rate. I locked in at 2.25% so my cost per point is 1.125c, which while higher than my personal threshold of 1c, it’s not that much higher and I can count on it for 50K worth of points a year. If you are looking to use Plastiq for a way to make a minimum spend requirement, you could use my referral code (19101) and get $500 in fee free dollars ($500 of your requested payment doesn’t attract their fees). That would help reduce your cost a little bit. I guess it all depends on your specific situation. I would also add that Plastiq is a legit form of Manufactured Spending that is on the right side of the law … if that matters to you. There are certainly other methods that definitely play in the gray. I’m in Calgary and would be interested in a meetup! Very interesting. MS just came up on my radar recently, and as someone who already puts a fair amount of money through credit cards for travel it is an intriguing concept. I live in in Calgary, so if you’re still interested in passing along some knowledge and would like to grab a coffee or a beer some time, I would be game. Cheers! What bank do you use that allows payments via plastiq? Having read other posts regarding the issue with AMEX and how it is now resolved I got a few questions regarding Plastiq. I currently have the AMEX Business Platinum which I got in March 2018 and I met the spending requirement and got the sign up bonus. I recently found out that I can use Plastiq to pay my property taxes, which are due in a month, and I am thinking of signing up for the AMEX Business Gold card and using Plastiq to help meet my minimum spending requirement and get the sign up bonus? As far as I know there are no outstanding issues with AMEX and Plastiq. I have not read all the fine print of the AMEX business cards but I vaguely remember reading a post stating that the business sign up bonus (either on the platinum or gold card) is a 1 time sign up bonus. Since I got the bonus for the AMEX Business Platinum card does that mean even if I meet the minimum spending amount for AMEX Business Gold card I would not receive the sign up bonus? Has anyone gotten both the platinum and gold business cards within a few months of each other and did/didn’t receive the sign up bonus after meeting the minimum spend requirement?